The Swift 5 release enables runtime checking of “Exclusive Access to Memory” by default in Release builds, further enhancing Swift’s capabilities as a safe language. In Swift 4, these runtime checks were only enabled in Debug builds. In this post, I’ll first explain what this change means for Swift developers before delving into why it is essential to Swift’s strategy for safety and performance. To achieve memory safety, Swift requires exclusive access to a variable in order to modify that variable. In essence, a variable cannot be accessed via a different name for the duration in which the same variable is being modified as an inout argument or as self within a mutating method. In the following example, count is accessed for modification by passing it as an inout argument. The exclusivity violation occurs because the modifier closure both reads the captured count variable and is called within the scope of the same variable’s modification. Inside the modifyTwice function, the count variable may only be safely accessed via the value inout argument, and within the modified closure it may only safely be accessed as $0. As is often the case with exclusivity violations, the programmer’s intention is somewhat ambiguous. Do they expect count to be printed as “3” or “4”? Either way, the compiler does not guarantee the behavior. Worse yet, compiler optimizations can produce subtly unpredictable behavior in the presence of such errors. To protect against exclusivity violations and to allow the introduction of language features that depend on safety guarantees, exclusivity enforcement was first introduced in Swift 4.0: SE-0176: Enforce Exclusive Access to Memory. Compile-time (static) diagnostics catch many common exclusivity violations, but run-time (dynamic) diagnostics are also required to catch violations involving escaping closures, properties of class types, static properties, and global variables. Swift 4.0 provided both compile-time and run-time enforcement, but run-time enforcement was only enabled in Debug builds. In Swift 4.1 and 4.2, compiler diagnostics were gradually strengthened to catch more and more of the cases in which programmers could skirt exclusivity rules–most notably by capturing variables in nonescaping closures or by converting nonescaping closures to escaping closures. 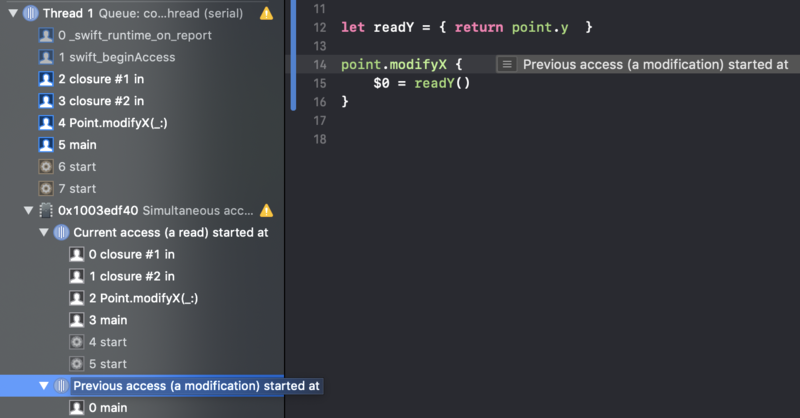 The Swift 4.2 announcement, Upgrading exclusive access warning to be an error in Swift 4.2, explains some of the common cases affected by the newly enforced exclusivity diagnostics. Swift 5 fixes the remaining holes in the language model and fully enforces that model1. Since run-time exclusivity enforcement is now enabled by default in Release builds, some Swift programs that previously appeared well-behaved, but weren’t fully tested in Debug mode, could be affected. 1Some rare corner cases involving illegal code aren’t yet diagnosed by the compiler (SR-8546, SR-9043). A source level fix is usually straightforward. The following section shows examples of common violations and fixes. The corresponding swiftc compiler flags are -enforce-exclusivity=unchecked and -enforce-exclusivity=none. While disabling run-time checks may work around a performance regression, it does not mean that exclusivity violations are safe. Without enforcement enabled, the programmer must take responsibility for obeying exclusivity rules. Disabling run-time checks in Release builds is strongly discouraged because, if the program violates exclusivity, then it could exhibit unpredictable behavior, including crashes or memory corruption. Even if the program appears to function correctly today, future release of Swift could cause additional unpredictable behavior to surface, and security exploits may be exposed. The two modifications are now on different variables, so there is no conflict. Examples of some common cases that cause build time errors can be found in Upgrading exclusive access warning to be an error in Swift 4.2. In many cases, as shown in the next example, the conflicting accesses occur in separate statements. // Copy `y`'s value into `x`. Simultaneous accesses to ..., but modification requires exclusive access. …then there would be no exclusivity violation, because in a simple assignment (with no inout argument scope), the modification is instantaneous. At this point, the reader may wonder why the original example is considered a violation of exclusivity when two separate properties are written and read; point.x and point.y. Because Point is declared as a struct, it is considered a value type, meaning that all of its properties are part of a whole value, and accessing one property accesses the entire value. The compiler makes exception to this rule when it can prove safety via a straighforward static analysis. In particular, when same statement initiates accesses of two disjoint stored properties, the compiler avoids reporting an exclusivity violation. In the next example, the statement that calls modifyX first accesses point in order to immediately pass its property x as inout. The same statement accesses point a second time in order to capture it in a closure. Since the compiler can immediately see that the captured value is only used to access property y, there is no error. point.y = $0;        // ...allowed as an exception to the rule. 1. Exclusivity eliminates dangerous program interactions involving mutable state and action at a distance. var newNames = oldNames // Aliasing naturally happens with reference types. SE-0176: Enforce Exclusive Access to Memory describes the problem in more depth. 2. Enforcement eliminates an unspecified behavior rule from the language. Prior to Swift 4, exclusivity was necessary for well defined program behavior, but the rules were unenforced. In practice, it is easy to violate these rules in subtle ways, leaving programs susceptible to unpredictable behavior, particularly across releases of the compiler. 3. Enforcement is necessary for ABI stability. Failing to fully enforce exclusivity would have an unpredictable impact on ABI stability. Existing binaries built without full enforcement may function correctly in one release but behave incorrectly in future versions of the compiler, standard library, and runtime. 4. Enforcement legalizes performance optimization while protecting memory safety. A guarantee of exclusivity on inout parameters and mutating methods provides important information to the compiler, which it can use to optimize memory access and reference counting operations. Simply declaring an unspecified behavior rule, as described in point #2 above, is an insufficient guarantee for the compiler given that Swift is a memory safe language. Full exclusivity enforcement allows the compiler to optimize based on memory exclusivity without sacrificing memory safety. 5. Exclusivity rules are needed to give the programmer control of ownership and move-only types. The Ownership Manifesto intoduces the Law of Exclusivity, and explains how it provides the basis for adding ownership and move-only types to the language. By shipping with full exclusivity enforcement enabled in Release builds, Swift 5 helps to eliminate bugs and security issues, ensure binary compatibility, and enable future optimizations and language features. Please feel free to post questions about this post on the associated thread on the Swift forums.